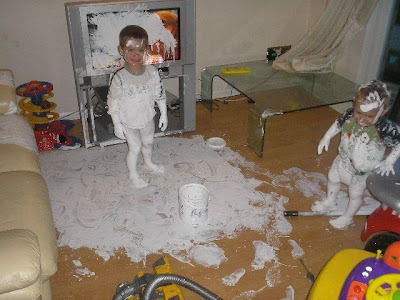 Wow - the kids could take some cleaning, especially if its oil paint. another thing for me to look forward too? OH HECK!!!!!! Reminds me of the time my friends daughter painted their neighbours car with white house paint- eekk! OMgoodness! Please tell me that that is not your house as well as not being your kids? I too am speechless! It takes fun to a whole new level! You've got to love them, but I'm pleased that's not my TV of couch. The rest you could scrub up or paint over.